Photos included in this posting were supplied by Karen Mitchell of Whitefire Photography. More of her work can be found on Facebook. My thanks go to her for allowing me to use them. I’m not sure how tonight’s gig nearly bypassed me. Normally something like this would have leapt out at me from the What’s On listings, screaming, “you need a ticket!” but, for some reason, I didn’t spot it until somebody specifically mentioned it to me. With the last few gigs at Fibbers starting at times different to those on the tickets, I had made a point of asking Four Stones Deeper when they would be starting tonight. After all, as I had managed to get a discounted ticket from them, it was the least I could do to turn up in time to see their full set. Unfortunately, their early start meant that some did miss a beginning during which, once again, Amy’s vocals suffered slightly from more power than precision but, as with the previous times I have heard them, they settled down as the set went on. After a comparative ly quiet start, the set seemed to get progressively louder with standard rockers Give It Up and Let Go before the next track (This Is It?) changed the tone with an interesting drum line and different guitar sound. Rise Again had a gentler opening, both musically and with Amy’s vocals before ending powerfully. It had been the best song of the set but was outclassed by Calm Before The Storm and superb set ender Sing It Back. Four Stones Deeper are a young band and one that deserve bigger support than they got tonight (last time I saw them, they were headlining a much fuller than normal Fibbers), so it’s a shame that they had to start before the advertised time. Amy is a very confident front-woman and her brother Luke is certainly more active than most bass-players. Guitarist Tom looked nervous tonight only really seeming to gain in confidence during the last song, despite playing well throughout the set, while Dylan provides a solid back bone to the songs. The good news is that Amy announced tonight that they were working on an album. I’ll be looking out for it. Finland’s Santa Cruz were the deciding factor in me going to tonight’s gig. The headliners sounded interesting but it was only when I watched the video for soft rock ballad Nothing Compares To You that I finally made my mind up. (It was also when Debbie wished it wasn’t too late to get a babysitter…) As the band, replete with long blond hair and vests, took to the smoke-filled stage, a dark orchestral backing track playing, it would have been easy to imagine that the 80s have never ended. Their set opener featured a chugging guitar riff and flying hair, then high-pitched vocals and screaming guitars punctuated Let’s Get The Party Started. There must be some rule for Finnish rock bands as, like the Von Hertzen Brothers before him, the next song saw frontman Archie balanced precariously on one of the speakers. (It must be another rule that Finnish CDs c ost £15, but that’s another story…) Taz played a short drum solo while Archie tried to get the meagre crowd to shout back at him before the band launched into Nothing Compares To You and then Relentless Renegades. The crowd may have been small, but Santa Cruz were giving it everything and could just as easily have been performing a sell-out arena gig alongside the likes of Bon Jovi or Def Leppard, although with slightly sleazier lyrics. Archie, along with Johnny (also on guitar) and Middy (bass) seemed to be using every inch of the stage and more as Johnny climbed over the barrier, ran through the crowd and performed part of the next song while standing on one of Fibbers’ rather flimsy looking wooden tables. Thankfully it held together long enough for him to finish and make his way back to the stage for their final song. Afterwards, the foursome mingled with the fans at the merchandise desk, signing CDs, having photos taken and chatting, seemingly genuinely grateful for the compliments being passed their way. That’s something you definitely don’t get at arena tours. 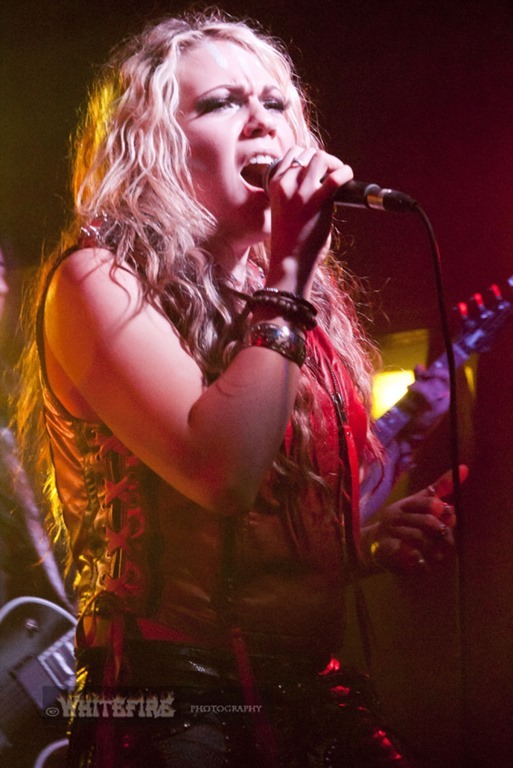 Kobra And The Lotus hail from Canada, giving tonight’s line-up a truly international feel. Another band with large stage banners either side of the drum kit, giving the impression that drummer Griffin Kissack was in some sort of cage, my early impressions were that they were a sort of cross between Iron Maiden and Evanescence, with a heavier sound and darker theme than Santa Cruz, as well as, with the exception of Kobra Paige herself, generally darker and straighter (but no less still) hair. The leather outfit that Kobra wore on stage gave her much more of an impression of being a rock goddess than the nice knitted number I spotted her wearing as she walked into the venue earlier. (I guess the disadvantage of venues like Fibbers is that artistes can’t sneak in through a back door.) The set opened wet with Nayana and her classically-trained vocals were already obvious. The darker No Rest For The Wicked was followed by Forever One and its synchronised headbanging across the band’s front line. A lot of warble was added to the vocals for Heaven’s Veins and I have to say I found it slightly off-putting. The darkness was dissipated slightly during the piano opening to Sanctuary but a crunching riff soon brought it back before being replaced by a short, much gentler guitar solo. There was a moment of slight comedy as Kobra mis-introduced a new song as War House, rather than War Horse. It’s a fast and furious track that reinforced the Iron Maiden feel by reminding me of Run To The Hills before coming to a rather abrupt end. The fast and light My Life and Lover Of The Beloved saw the crowd getting more and more into the music but, strangely, dancing rather than headbanging. Kobra and the rest of the band left the stage while Kissack performed a proper rock drum solo (albeit with the aid of a backing track in places) before returning for Dark Passenger, another of the lighter songs, and the superb and darker 50 Shades Of Evil (check out the horror-film inspired video) which was announced as the final band of the set. Even a new fan like me knew that there had to be an encore – the top hat balanced on the corner of one of the stage banners would have been a clue, even if one of the songs featured on the band’s website hadn’t been played yet. “What do you want?” asked Kobra before performing Aria Of Karmike and then donning the top hat for Welcome To My Funeral. Some of the titles may give the impression that the songs are darker than they actually are. This was no doom-laden performance, but definitely not quite as light as either support act. Metal rather than rock. Again the band’s performance belied the size of both the venue and the crowd. 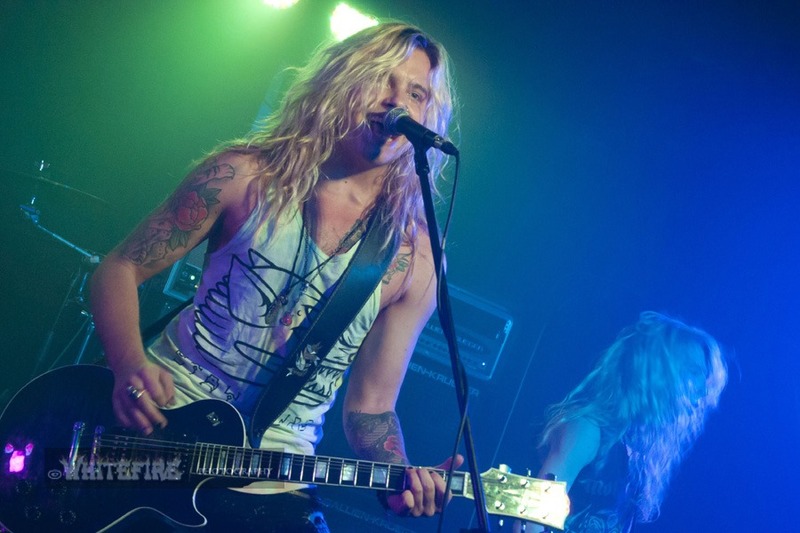 Kobra performed with a smile and there was lots of interaction with those at the front of the crowd. Afterwards she took control of the merchandise table, handling purchases and happily signing CDs. International touring bands like these deserve bigger crowds than they got tonight and the numbers they got may mean that they never return. I for one am glad I took the opportunity to see them when I could. 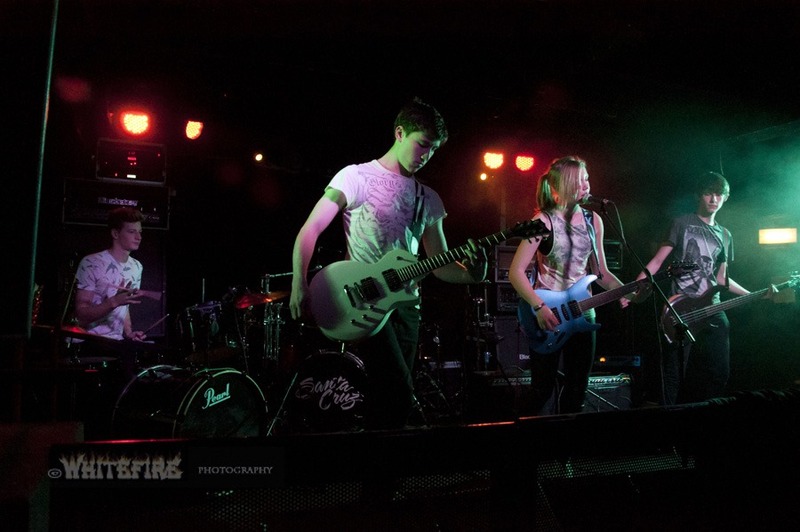 This entry was posted in Live Music and tagged Fibbers, Four Stones Deeper, Kobra And The Lotus, Santa Cruz. Bookmark the permalink.